For sometime now, I’ve been thinking of posting some easy-to-cook, healthy recipes here (encouraged by my chief taster of course!). But I just didn’t get down to it. Then, very recently, a wonderful woman stopped by my blog and a connection was made. I discovered, besides other things about her, that she had some really nice food blogs – healthy and delicious food with pictures to die for! And an idea started to simmer…….I requested Sangeeta Khanna to share some of her recipes on Everyday Gyaan and she was quick to agree. Today, Sangeeta is sharing a recipe for a healthy and delicious breakfast and will be back with more yummy stuff soon. Do stay tuned for more…… May you be inspired – everyday! I discovered Corinne’s blog recently and found a connection happening immediately after I read a few posts here. I find a blissful sense of ‘spiritual intelligence’ in the posts as well as the reader’s comments here and I am left with something new to ponder about every time I read something on this wonderful blog. Molasses and jaggery are two of my favorite sweeteners. Honey comes next and maple syrup. However, the latter is out of the question . We do not get any maple syrup here in India. We do get all palm sugars and molasses in India. However, modern living and the convenience of processed food has made it a bit difficult for all these palm sugars and molasses to reach our table. Besides these are marketed poorly in our country. You need to look out for them in health food stores or contact your village sources. It is time we start celebrating our own sugarcane and date palm molasses and a terrific variety of palm sugars available in many parts of India. 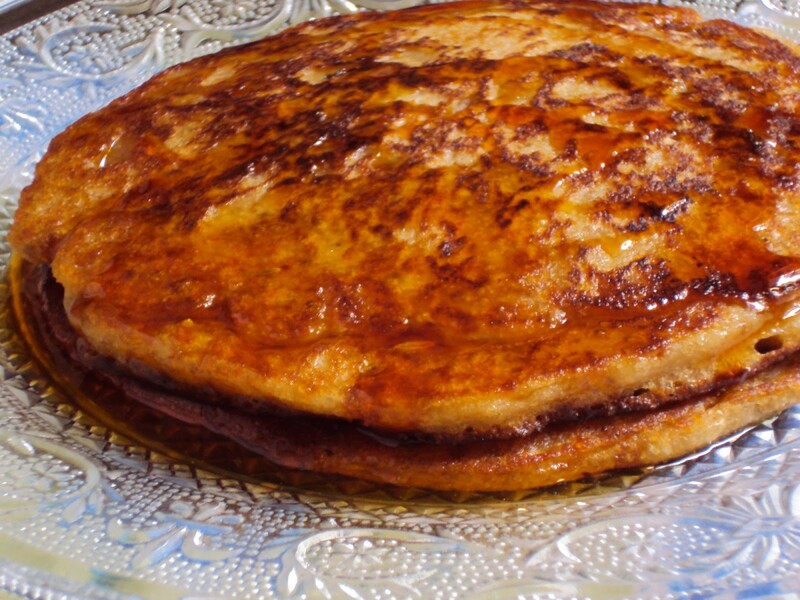 Ingredients:To make 2-3 pancakes serving 2-3 for breakfastwhole wheat flour (atta) – 1 cupwheat bran – 1 tbspfresh yeast – 1 tsp ( or dry active yeast 1 tsp)fennel seeds – 2 tspsalt – a generous pinch ghee (clarified butter)- about 2 tbsp molasses – 2-3 tbsp or more if you like to drizzle the pancakes liberally.ProcedureRevive the yeast in warm water . Dissolve a tsp of molasses in 1/2 cup of warm water first , add the salt and the yeast and wait till the yeast becomes frothy. Now add the flour, wheat bran, fennel seeds and some more warm water to make a tacky batter . The consistency should be something between a batter and a dough …tacky and difficult to flow. Keep covered in a warm place for 10-15 minutes and it will rise and bubble . In winters it may take longer so you can keep the batter in a warm oven ( 35 – 40 degree C ). Heat a flat base pan or griddle ( I use the Indian tawa used for making chapatis ) , grease generously with ghee and pour a big ladleful of batter onto it . The batter may not make a nice round shape but you can use a spatula to spread lightly, not disturbing the naturally forming bubbles. Flip when browned on one side and drizzle more ghee to fry nicely. So here it is a perfect desi pancake with a golden goodness found in our country. The syrup is rich in vitamins and minerals, not empty calories like sugar. Honey can be used if you don’t find molasses in your part of the world.